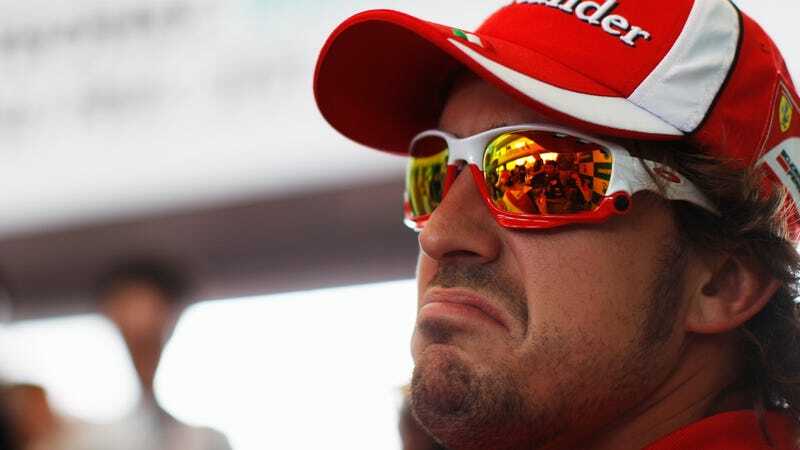 Fernando Alonso in one of his happy moods. Dry ice is pumped into Jenson Button’s cockpit before to race to help him cope with the equatorial heat and humidity. A rare glimpse of the inside of the Red Bull RB7’s bodywork shows gold foil used as a heat deflector—just like in the McLaren F1. The first corner shows Sebastian Vettel in a lead he would not relinquish, followed by the twin Renaults of Heidfeld and Petrov creeping up on the outside line. A Formula One grid girl not dressed in skanky clothes? Only in Malaysia! The Red Bull pit wall during qualifying on Saturday. Vettel would take pole with Mark Webber taking third. Sebastian Vettel after winning the race. A close-up of the exhaust-boosted diffuser on the McLaren. The Red Bull pit wall during qualifying. Second from left is technical director Adrian Newey, third from left is team principal Christian Horner. Michael Schumacher in yet another unhappy race. Look who’s smiling—and who’s not. Seb Vettel having a killer time.